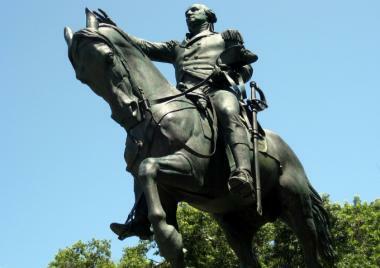 The Parks Department nixed an artist's plan to dress up the George Washington statue in Union Square to look like a tourist. UNION SQUARE — Don't mess with George. That's the city's message to a Brooklyn artist who wanted to dress up the George Washington statue in Union Square to make him look like an average New York tourist. In a video posted to the online fundraising site Kickstarter earlier this month, artist Leon Reid IV issued a public appeal to bring his next project, "Tourist-in-Chief," to life. He asked for $3,000 so that he could outfit the founding father with items like an oversized camera and an "I ♥ New York" hat, hoping the city would get the joke. “We hope that the New York City Parks Department has a sense of humor, as well,” Reid said in his video, prior to his project being selected for inclusion in the seventh annual Art in Odd Places festival in October. Whether or not the Parks Department found the humor in Reid’s idea is unclear — and apparently unimportant. Turns out the city agency frowns on dressing up public statues. A spokesman confirmed that the department had denied Reid’s request. The artist did not return several requests for comment, and it is unclear what he intends to do with the project going forward. What is also unknown is what he plans to do with the funds already raised for the project. As of Tuesday, backers had pledged nearly $3,100 — more than Reid's initial goal. The page also indicated there was still more than a week left to pledge money to the project. Kalia Brooks, a co-curator for the upcoming Art in Odd Places Festival, declined to comment about what the plans were for the project going forward. But she did say that all the pieces for the festival were chosen based on their ability to portray ritual in some way. "We were most attracted to projects that intervene in people's everyday habituations as either disruptions or by calling attention to the practices that are deemed valuable in secular culture," Brooks said in an email. In 2006, Reid mounted a similar exhibition, "True Yank," in the English city of Manchester, dressing a statue of Abraham Lincoln in a Yankees cap, gold chain necklace and other jewelry.